Violence against women and girls is a huge problem, one which Partners for Prevention and UN Volunteers are addressing in Asia and the Pacific. Together, they are changing people’s perceptions and aiming for prevention before it happens, rather than only after the damage is done. As many as 68 per cent of women and girls aged 15-49 in Asia and the Pacific face some form of violence in their lifetime. This is one of the highest levels reported in the world. Violence against women exists in every society. It encompasses different forms of physical, sexual, and psychological abuse. In 1993, the UN General Assembly provided a framework for action against this violence. More than 20 years later, 1 in 3 women are still affected by either physical or sexual violence. One of the problems which contributes to its high prevalence is that very often it simply isn’t reported. Partners for Prevention (P4P) is a UNDP, UNFPA, UN Women and UNV regional joint programme for the prevention of violence against women and girls in Asia and the Pacific. The joint programme brings together the combined strengths of the four UN agencies, along with governments and civil society, to promote and implement more effective violence prevention programmes and policies. Phase 1 of the programme (2008-2013) focused on research, capacity development and networking, and communication for social change. The programme is now in its second Phase (2014-2017) which is focused on prevention interventions, capacity development and policy advocacy. Partners for Prevention is a regional programme which works on the ground with local volunteers who understand their own community’s culture, and speak the language. P4P mobilizes these volunteers to act as a bridge between the UN, governments, non-profit organisations, and local communities. Six international and national UN Volunteers serve as Project Coordinators with P4P in Bangladesh, Cambodia, Indonesia, Thailand and Viet Nam. Currently, P4P is engaging men and boys in Bangladesh, Cambodia, Indonesia and Vietnam, helping to address violence against women in these areas. By addressing the underlying assumptions and beliefs held by men, volunteers advocate for prevention directly to men as opposed to intervention after a women or girl has suffered gender-based violence. P4P volunteers come from local communities and are encouraged to engage with their peers to support learning about, and advocacy against, violence against women and girls (VAWG). Through their roles, volunteers add unique value to the programmes for prevention and awareness. They also proactively include marginalized and vulnerable groups, allowing their voices to be heard and empowering them to contribute to the community’s goal of preventing VAWG. In Bangladesh, UN volunteers with P4P successfully launched a community outreach programme to raise awareness of VAWG prevention. The community outreach effort has been filmed and is available online, which has allowed the programme to reach even more people in disparate communities. 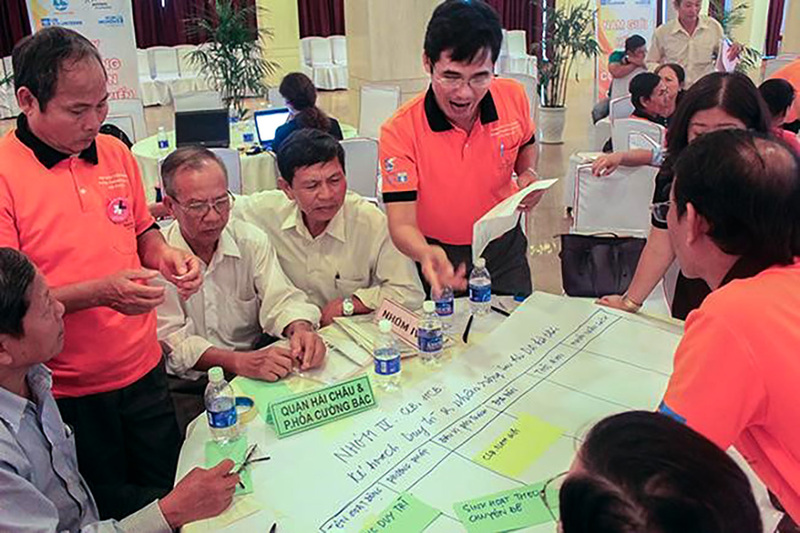 In Da Nang, Vietnam, UN Volunteers came together with communities to set up Male Advocacy Clubs that acts as a bridge between concerned citizens and those affected by violence against women. An example of which is the empowerment of Tran Van Chuong, who, through support from the club, was able to help a neighbour after she was beaten by her husband. National UN Volunteer Phan Thanh An was responsible for helping set up these clubs, which are supported by UN Women. The clubs benefit from the presence of a UN Volunteer trained as a facilitator, who leads discussions amongst local men and encourages reflection about VAWG. "What I have learned from other volunteers and from my own hands-on experience is that, everyone, whether well-off or not, employed or not, can give a hand in helping others as long as they truly care,” An stated. The Partners for Prevention programme helped to change communities and empower the women within them. UN Volunteers helped bring together disparate agencies and communities, through facilitating discussion and providing local perspectives—and continue to do so. Communities in Cambodia and Indonesia have also seen increased interventions aided by the programme. UN Volunteers are important and versatile. They have the ability to bring together different groups of people by including and enabling the participation of local communities. Through volunteerism, local people become champions of change within their own communities, helping increase knowledge and support for important challenges, such as the prevention of violence against women and girls.